Pack dehydrated fruits and veggies in your child’s lunchbox for a nutritious snack. 3 Does Freeze-Drying Affect Nutrition? Eat sweet potato chips in the summer, berry cereal-toppers in the winter and apple pieces in the spring. 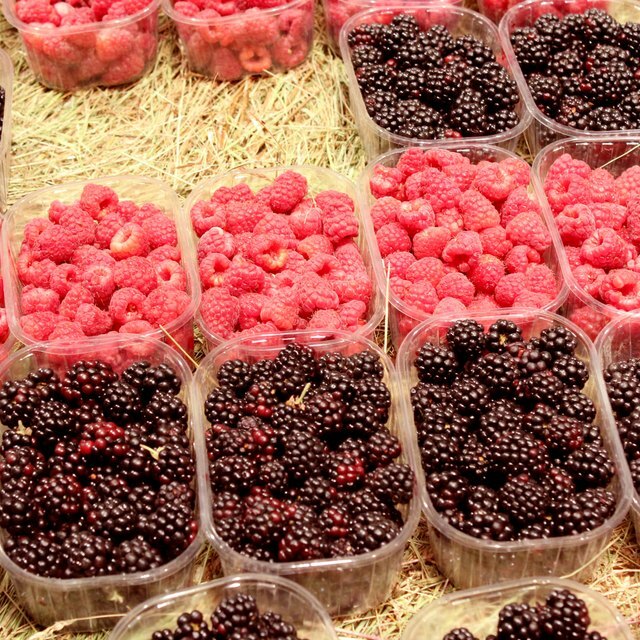 Buy a batch of your favorite berries, beans, squash, root vegetables or tropical fruits at the farmer's market and dehydrate the fruits and vegetables for nutritious lunchbox snacks, hurricane survival kits or hiking rations. Many markets and outfitters also conveniently carry prepackaged dehydrated produce. Dehydrating fruits and vegetables maintains much of its nutritional value while decreasing storage space and weight and allows you to eat seasonal produce all year long. One of the oldest food preservation processes, dehydration removes moisture, the environment where microorganisms thrive, according to the Virginia Cooperative Extension. Lack of moisture slows the growth of bacteria, yeasts and molds and the enzymatic reactions within food. The removal of water delays spoilage to give food a longer shelf life without destroying much of its nutritional value. The dehydrated grape is perhaps one of the best-known types of dehydrated produce. Moisture is removed from the grape, which contains 80 percent water, to form a raisin. You can dehydrate any fruit, however, including apples, apricots, bananas, blueberries, cranberries, mangos, peaches, pears, pineapples, raspberries and strawberries. Dehydrated fruit is a great way to sneak in a few extra vitamins and minerals while baking or making trail mix. Dehydrate any vegetable, including asparagus, beans, beets, broccoli, carrots, corn, potatoes or sweet potatoes, for a healthy substitute for the traditional potato chip. The dehydration of fruits and vegetables does not alter the calorie count. Calories become concentrated into a smaller, more compact mass without the zero calorie water. If snowed-in after a blizzard, hiking for the day or grabbing a quick, mid-afternoon snack, the more compact consumption of calories makes sense. If weight-loss is your goal, you may opt for fresh fruits and vegetables so that water provides a filling, zero-calorie portion of the food. The fiber content of dehydrated fruits and vegetables does not change. Water and fiber work together to improve your digestive process. In order to get the full benefit of the fiber, therefore, you should consume water with your dehydrated fruits and vegetables. Most vitamins and minerals remain intact during the dehydration process. Heat and air, however, destroy vitamin C. Air exposure also destroys vitamin A. Sulfur, when used in the dehydration process, protects vitamins A and C. Fruits and vegetables lose minimal amounts of minerals during the dehydration process. A report by the American Institute for Cancer Research, or AICR, suggests that dehydrated fruits retain almost the same levels of antioxidant phytochemicals as fresh fruits. AICR recommends consuming more dried, frozen or fresh fruits in your diet to obtain their antioxidant benefits. 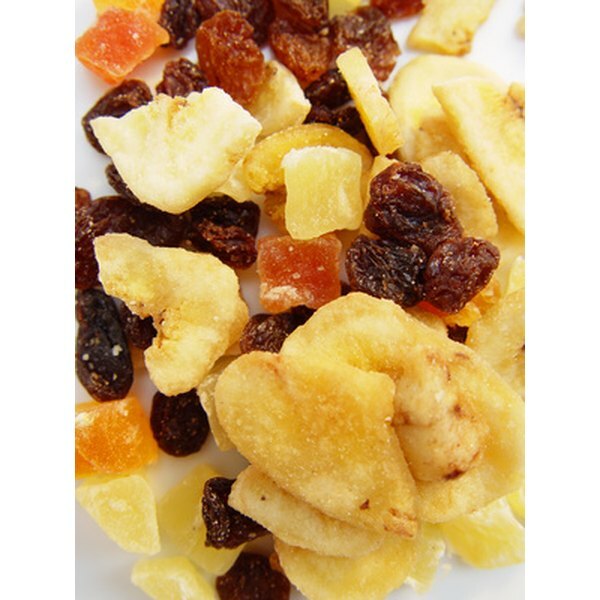 One serving of dried fruit is 1/4 cup and a serving of fresh fruit is 1/2 cup. To ensure that dehydrated fruits and vegetables maintain their nutrient values, store dried foods in a cool, dark, dry place. Heat, light and moisture can destroy vitamin and mineral values and facilitate food deterioration. Dehydration slows deterioration of food, but does not halt the process completely. A Colorado State University fact sheet on drying vegetables recommends that you use dehydrated foods within a year. Kristin Shea has been writing professionally since 2008. Her fitness works include a yoga manual and Skincare News. She has acquired extensive legal writing experience during more than 10 years of legal practice. Shea is a licensed attorney and certified yoga instructor. She earned a Bachelor of Arts from University of Florida and a Juris Doctor from University of Miami Law School. How Much Water Should I Drink With a High Fiber Diet?